Game On Scotland goes live! Published on April 30, 2013 in Educational resources and Games Legacy. 0 Comments Tags: curriculum, education. We are delighted to inform you that Game On Scotland has been launched today to help practitioners use the Glasgow 2014 Commonwealth Games as an inspiring, motivating and fun context for learning. Game on Scotland is the education programme for the Glasgow 2014 Commonwealth Games and has been developed as a partnership between Education Scotland, Glasgow 2014 Ltd, Glasgow City Council and the Scottish Government. Using Games as a context for learning has been inspirational for many educational establishments in the past and provides schools with opportunities to develop learning across the curriculum, often in partnership with their communities and relevant organisations (see case studies). opportunities for schools to be part of the Games, with competitions and special events which will put learners at the heart of the Games. Many schools and organisations are already thinking ahead towards the Glasgow 2014 Commonwealth Games. Tell us about your goals and initiatives and we will literally put your schools/organisations on the interactive map. Take part in the Game On Challenge before 24 May and your school might win a visit from Clyde, the mascot. Through this competition your school can be part of the Games. Game On Scotland is asking every school in Scotland to get their pupils to design posters, which will decorate the rooms of the Athletes’ Village. You are encouraged to hold your own competition in your school and then submit the winning pieces of artwork for inclusion in the village. Register for the competition on the Game On Scotland website. Competition packs will be issued in August with winning entries announced in early 2014. Published on April 30, 2013 in Games Legacy and partnership. 0 Comments Tags: awards, Youth Legacy Ambassadors. 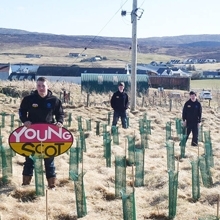 Youth Legacy Ambassadors from Shetland have been awarded winners of the Environment Award at the Sunday Mail Young Scot Awards 2013. Over the past 12 months, they’ve worked had to promote legacy themes with a particular focus on helping their community become more environmentally responsible and live more sustainably. They have secured over £5,000 of external funding for their project which involves visits to local renewable projects and encouraging local children to stay active. They’ve also helped secure 420 trees which will be a new feature in their local community and laid a sustainable legacy plaque, which was made by the Cunningsburgh glass recycling business. Published on April 30, 2013 in Glasgow 2014 and partnership. 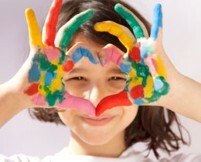 0 Comments Tags: partnership, Unicef, values. UNICEF, the CGF and the Glasgow 2014 Commonwealth Games have announced a unique collaboration that seeks to touch the lives of children in Scotland and in Commonwealth countries across the world. This partnership brings together UNICEF, the world’s leading organisation for children, with the biggest sporting and cultural event ever to take place in Scotland, with the aim of inspiring and enabling children to be the best they can be. The partnership was unveiled last week by the first Olympic female boxing gold medallist, Nicola Adams, at Swinton Primary School in the east end of Glasgow – a Rights Respecting School that is supported by the UK Committee for UNICEF (UNICEF UK) and an example of grass roots level activity in Scotland. The event was hosted by pupils who demonstrated their hopes for a better future for children in song, poetry and pledges before asking Nicola, Glasgow 2014 Chief Executive David Grevemberg, UNICEF UK Executive Director David Bull and CGF’s Bruce Robertson, to add their opinions to the wall. 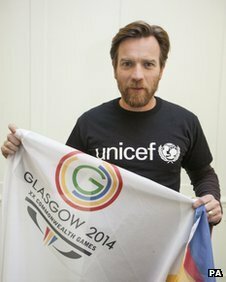 Ewan McGregor and David Beckham have also given their backing to plans to put children at the heart of Glasgow’s 2014 Commonwealth Games legacy. The Scottish Hollywood star and England footballer are ambassadors for United Nations children’s charity Unicef . Actor McGregor, who is from Perthshire, said the link-up “opens the door to helping transform children’s lives”. “The children of Swinton Primary in Glasgow have a powerful message for children throughout Scotland and across the Commonwealth. Put simply, they want to be the best they can be. I am thrilled that through our new and bold partnership with UNICEF, the Glasgow 2014 Commonwealth Games aims to help them and hundreds and thousands of other children achieve that. 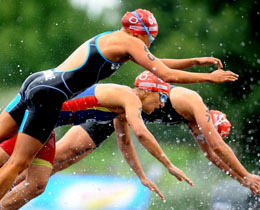 “The Commonwealth Games taking place in Glasgow in 2014 provides us with a unique opportunity to harness the immense power of sport and culture for the best possible outcome – to improve the lives of children in Scotland and across the Commonwealth. “I am absolutely delighted to support this partnership and be part of the event this morning. It was great to meet the children and hear about their aspirations and what they need to be the best they can be. This is a fantastic collaboration which will reach out to every child in Scotland and much further afield. UNICEF reaches children in Commonwealth countries through its global network of country offices and National Committees working to promote the rights of every child to health care, water, nutrition, education and protection with a focus on the most vulnerable and disadvantaged. In Scotland, UNICEF UK has child rights education campaigns for children in schools, health settings and local government. The partnership, with the CGF and Glasgow 2014 aims to raise funds for UNICEF’s work in Commonwealth countries around the world.